Affordable Accoutrements: Visit the Vamp! Thank you for all your thoughtful comments on last week's tablescape post. Some of you even sweetly expressed concern for my emotional health. I'm fine ... honestly! It was just an "art project." Anyway, even if I had been feeling slightly blue, I'm definitely melancholy no more! she generously mentioned Affordable Accoutrements. In the same sentence with a reference to uber blogger, Eddie Ross! Was I honored? Well ... yes, more than a little. Make sure and visit Jason Murakawa at www.SmallMasterpiece.com. What a brilliant concept! 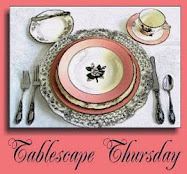 Thank you, as always, Susan for hosting Tablescape Thursday. Visit Between Naps on the Porch for lots of great tablescapes from Susan and all her talented guests. I hope you'll forgive me for not posting a new table this week. I'm working on something fun for next week. I hope you'll join me! A quiet setting of for a solitary dinner. So peaceful & inviting. And I will be sure to check out last week's scape. Glad to know you were feeling artistic and not truly blue. But how could anyone be blue with all of that pretty silver, china, and crystal around? And the candlestick is great, too! I look forward to every tablescape. I thought last week you were letting the gray weather get you a little bluesy. I am happy you were just being artsy. Congrats, Congrats, Congrats. You know any nod will do. We are all so happy for you. Just to get a mention is phenomenal. I am so proud. I loved your dinner for one. Sometimes we all need the solitude. I can think of days that would be so nice. I have had some stressful ones with work, and to be able to just sit for one minute in peace and quiet, yep I would love to dine at that table of yours. Have a beautiful evening. I so love to come and see what you are up to. Thanks for sharing. I echo Sheila in my sentiments. You have the most beautiful collection of dishes, silver and crystal of anyone I know! I went back and looked at your post and I must say it was a bit wistful...but I love the portrait of you and the poem. 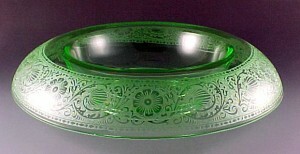 Perfect for that lovely place setting! Congratulations Bill, this is well deserved, and you have been a huge inspiration to me. Well a hearty congratulations to you Bill! You deserve recognition for your creativity and style! "I feel your pain." I have to admit, although I initially viewed the melancholy table scape as "an art project" there was a bit of a pause in your blogging...........so it's understandable why there was a note of concern among the people. I am looking forward to your latest project. You are so talented and just want you to know how much I enjoy your blog. Sadly, I did miss last weeks post. Glad to have a 2nd chance. Lovely, and congrats on your well deserved recognition. Congratulations. What wonderful recognition. I'm so happy for you. Who know where this could go? Congrats Bill! I've said you always inspire. Hope you get to stop by Vintage Alphabet to see the 'A's at my blog. Congratulations! What a beautiful setting. Thanks for sharing and happy TT to you! Congratulations on being mentioned on her blog! Thanks for sharing those links with us! Bill you have style and class! !~ This is beautiful! Bill, Congradulations for the recognition on Jason's blog. Wow! But I would not expect less. You are a master of masterpiece collections! You never disappoint! Bill-Congratulations friend--You have hit the big time!! I prefer to think of your look in the last post as "pensive"--like Rodin's The Thinker! I love Valorie's blog too! Bill your tables always make me gasp. They are each and everyone of them stunning. So beautiful, creative and you! always enjoy your blog and you so richly deserve the recognition! Congratulations! What an honor. You deserve it. I hope you are doing well and ready for the wintry mix we are expecting Friday. I hope we just rain. If all the percipitation turns to ice we are in for a big mess. Wow! I missed it last week, but those chargers & dishes are gorgeous! Congrats on your honor! I'm just another blogger, so thanks for the shout out! I love making connections via all the different and wonderful blogs out there. And thanks for rocking the vote for Eddie! No matter how big you get, you're nothing without your peeps! It would be FABULOUS to sit down at a table with the VAMP... she is DIVINE! Congratulations!! How wonderful to have your work (or is it play?) recognized. You deserve the recognition. You never fail to bring us beautiful tables in beautiful settings. I look forward to visiting every week. Thank you for all you've done to enrich our lives. Hope your feeling better. I guess it's just a winter tiredness (fingers x for that). Thanks for sharing your fav bloggie friends. Unfortunately, I live in the other side of the globe. Anyhow, thanks a mill for sharing the gorgeous ideas and the motivation. Congratulations..you deserve the mention for all your beautiful tables. I'm going to check out that table from last week since I missed getting around to everyone - busy time a work last week. Cheers! Congratulations - I missed last week's post but oh I love those dishes. Your tablescapes are always fantastic. Congratulations on a well deserved mention. The Vamp really knows what she talking about and I couldn't agree with her more here. 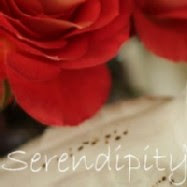 Thank you for always inspiring all of us that visit your blog. I was reading through your last post and table setting and was pleasantly surprised to see "my" drum table. Where did you get yours? My parents bought theirs in the 40's and since most of their furniture came from Jamestown Furniture, I as assuming the drum table did also. Lovely, lovely tablescape! Your table is warm and romantic just like my style of decorating. Thanks for sharing. Congratulations to you. Your tables are so beautiful. You must spend hours polishing, because everything always looks so lovely. The Birds ... of Paradise!